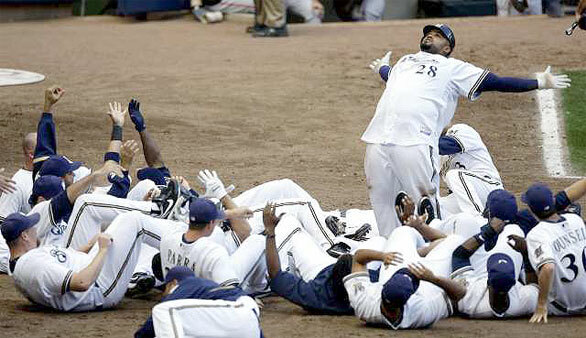 No ones presence was felt quite like Prince Fielder's at Miller Park. When "Moments In Love" (by Artist of Noise) hit the speakers, you were in for something special. Fans in the right field bleachers sat with an exhilarated amount of attention. Children and their fathers would wait for that crack of the bat by Prince, hoping a moon shot would come their way. That was just one thing that excited fans about Prince. Prince will always be well respected in the Brewers organization not only for the way he performed at the plate, but how he performed away from the game. Sure, Prince had his moments where he showed anger and frustrations. He had a few blow-ups in the dugout (pushing Manny Parra, tossing a gatorade jug) as well as going after the Dodger's locker room. But, that just showed his love for the game of baseball. He is a competitor. In six full seasons (972 games) with Milwaukee, he only missed 13 games. So, what is there to remember about Prince? I think the question in where do you start? Lets look at what the other guys have to say. I myself have a few fond memories of Prince as a Brewer. Who could forget his controversial celebration (above) after his walk off home run against the San Fransisco Giants in 2010. Or, his two career inside the park home runs against the Minnesota Twins and the Toronto Blue Jays. Or recently, jacking a 3 run home run in the All-Star game to help the National League win the game and was awarded the game's Most Valuable Player. My favorite memory of the 2011 season with Fielder was on June 12th. The Brewers were down 3-2 in the 6th inning against the St. Louis Cardinals. Just before Fielder walked up the plate, Ryan Braun singled to left which scored Mark Kotsay. With Braun on 1st, Fielder lauched a 2 run home run 440 feet (below) to give the Brewers the lead and the eventual victory. With that win, the Brewers were in sole possession of 1st place over the Cardinals. I think that describes Prince the best. He was there for the Brewers when we needed him most. Always made an impact, always showed up in the clutch. He never once gave up on his team. He will always be remembered for the giant grin he always had on his face. The Brewers lose a great leader, a best friend, and a brother to some. Rickie Weeks, for one, is losing a family member. Weeks and Fielder grew up together as kids in Orlando, were they now live today. Weeks, also, is the godfather of Fielder's son, Jaden. Former Brewer, Casey McGehee, also had a strong relationship with Prince. Casey's son, Mack, who has cerebral palsy, is Prince Fielder's best friend. During pre-game warm ups, Prince would always encourage Mack to come out onto the field and interact with the other Brewers. Prince was a big role for the McGehee family. Which brings me to my last question. I'm sure I'm not the only one who has seen this, but I'm puzzled as to why there is so much hate by the "fans" towards Prince. 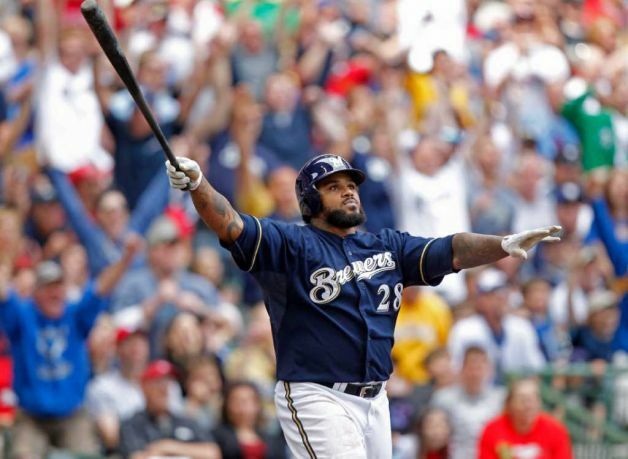 What Prince Fielder did for the Milwaukee Brewers in the six and a half years is something legendary. He turned our team from a joke to wild card winners and eventual NL Central champions. The fans need to understand that the bank account for the Brewers isn't of what the Yankees, Red Sox, Cubs etc. have. Its the big negative of being in a small market. To go out and call him a traitor and only playing for the money is absolutely ludicrous. Prince goes to a team, the Detroit Tigers, that is a contending team who won the AL Central last season. He is filling a role of Victor Martinez, whom the Tigers lost already for the 2012 season to an ACL injury. Finally, Prince Fielder's father, Cecil, played for the Tigers from 1990-1996. At age 11, Prince was launching balls out of Tigers Stadium during batting practice. And for fans to call him derogatory terms, ones that relate to his weight, they again must not know how many games Fielder missed, or should I say didn't miss for the Brewers. In the end, Prince's name will always be brought up with the likes of Robin Yount, Paul Moliter, Rollie Fingers, Geoff Jenkins, and Ryan Braun when the names of legendary Brewer players are brought up. The Brewers community will have to get over him not playing for us anymore and move on. For now, Mat Gamel is our starting first baseman, who has been exceptionally well in the minors. I pray he can carry that talent over to the Bigs and be a major part of our team. And who knows, maybe the next Prince Fielder will be in our midst in 2012? And who says we haven't seen the last of Prince in Milwaukee? That's the beauty of baseball. Everything is unexpected, and anything can happen.